San Jose State University students used their creative wits, quick thinking and ability to collaborate using Adobe Creative Cloud Applications when challenged to design graphics in a tournament sponsored by the university’s eCampus Department and Silicon Valley-based Adobe Systems, Inc. Students applied to participate and nine pairs were selected to compete. 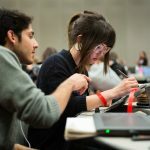 It was all part of the Feb. 24 “Adobe Creative Jam,” where the competing teams had three hours to produce computer-generated graphics that represent — to their imaginations — the theme “Fake News.” They were only informed of the topic, a phrase coined following the 2016 presidential election, by the event host at the start of the evening competition held in the Student Union. The artwork produced by the team of Mariella Perez and Miles Vallejos, both senior graphic design majors, was judged best by both voting bodies. Their design depicted many current national issues, including “Immigration,” being swept under a rug portrayed by the American flag. Perez explained how they approached the Creative Jam challenge. “We devoted the first hour to ideation and the final two hours to execution,” she said. While the general audience honored just one team, the panel of judges recognized an additional twosome. 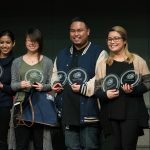 Earning that second place nod, for their entry “News is Defined by Truth,” was the team of Vasudha Varma, a graduate student working on her master’s degree in human factors, and Ashley Chung, a freshman majoring in animation. Varma and Chung became acquainted online and only met in person for the first time just before the Creative Jam began. In addition to getting a trophy, each winning competitor received a year of creative cloud membership from Adobe that allows them to use the software package for free after they complete their studies. As current SJSU students, they already have complimentary access to Adobe products. Additional students who attended, while not selected for the design competition, still benefitted from the event. They were able to have their personal design portfolios reviewed and evaluated by creative directors and design professionals from organizations such as Facebook, Yahoo and other Silicon Valley-based agencies and technology companies. Jennifer Redd, director of SJSU’s eCampus, noted that the Creative Jam is an example of the university’s partnership with Adobe. The company also hosts an annual Adobe Day in which SJSU faculty and staff visit the downtown San Jose headquarters to learn more about new products or features of existing products that can be used to enhance teaching and learning. 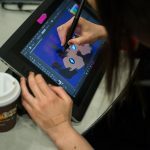 Adobe, which sponsors similar events for other universities around the country, is able to promote its software products on campus to discover how the students use them. 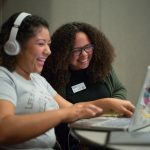 “Our goal tonight was to show what is available to San Jose State students and faculty, in terms of our mobile applications and desktop applications, while extending that into other disciplines outside of just the creative ones,” said Liz Arias, Adobe’s customer success manager whose clients include SJSU and other CSU campuses. The graphic designs of each of the teams that competed in the Creative Jam, can be viewed online via Adobe’s Behance Portfolio Review website.